This granite stock of the Papachacra formation, a geological structure in which there are deposits and mines, is located 75 kilometers in a straight line to the North of the town of Belén in the province of Catamarca, Argentina. It is accessible from Belén by national route No. 40 until the town of El Eje (47 km). Continue from there by national route 53 until Puerta de Corral Quemado (19 km) and then by the provincial route No. 36, 17 km to Corral Quemado. Throughout this journey, the road is made of gravel and well preserved. The 20 remaining kilometres to the village of Papachacra, to the North, are irregular and should be done in 4 x 4 vehicles. 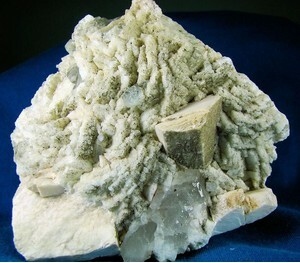 Granite stock of the Papachacra formation, on its western slope ("Cerro León Muerto"), has a slightly oval shape, and its approximate boundaries are: the river "La Cuesta" to the North, the "Quebrada del río Blanco"(El Cajon) to the South, the town of "Papachacra" to the East and the "Pampa del Arrimo" to the West. Located within the system of "Sierras Pampeanas", it has an approximate altitude of 3,100 m. asl. 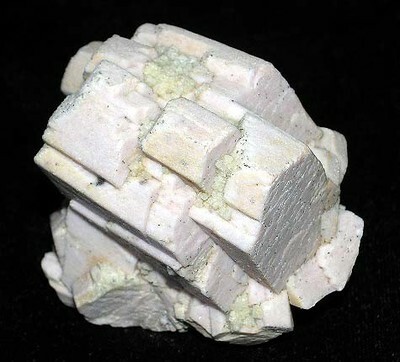 It is embedded within the orthogneiss of the "Chango Real Formation" and it is a whitish-pink granodiorite of granular texture in pseudoporphyric and aplitic sectors. 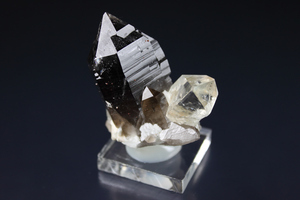 It is composed of quartz, plagioclase, orthoclase, biotite, muscovite, tourmaline, topaz, fluorite and opaque. 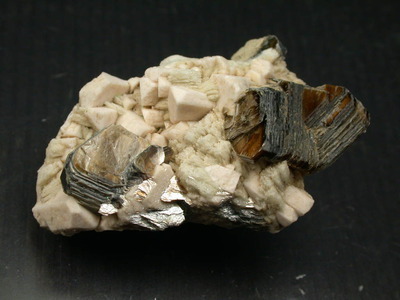 This stock was subjected to a process of deuteric alteration because of streams rich in volatiles, causing the formation of miarolitic cavities filled with idiomorphic crystals of potassium feldspar (microcline), smoky quartz, muscovite, topaz, florencite-(Ce), tourmaline, etc. These processes of alteration are also evident in the aftermath of albitization and silicification, which are joined by a marked kaolinization of minerals of the first generation and cataclastic phenomena. 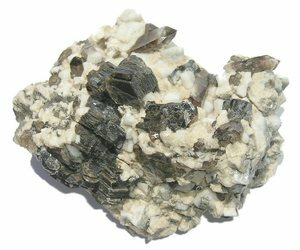 According to its modal composition, one can classify this rock as a monzogranite on the border between sub-alkaline and alkaline granites. Conducted isotopic K/Ar dating show an age of 117 million years (± 20 million years), corresponding to the lower Cretaceous. Intruding the "El Portezuelo" granite (granite Papachacra) is a suite of alkaline rocks. The late intrusive in this group are rhyolites peralkaline (comendites) with an extremely high content of some HFSE (Zr, Nb, Y, etc.). 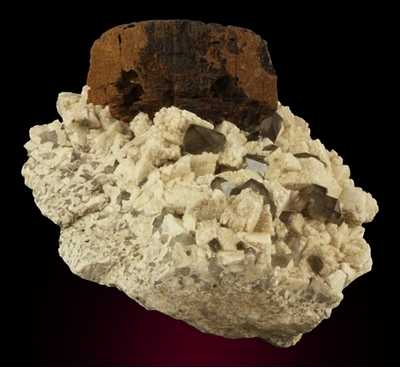 They are classified as granitoid of type A and belong to the Group A1. This suggests an extensional rift or environment of hot point towards the upper Carboniferous, considering that the shutdown Rb–Sr trend alkaline rocks occurred around 300 Ma. 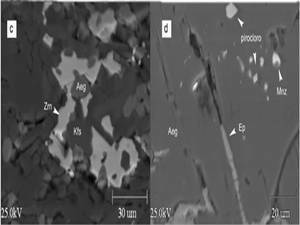 The relationships of trace elements are allied with differentiated mantle melt contaminated in a variable degree with cortical material. 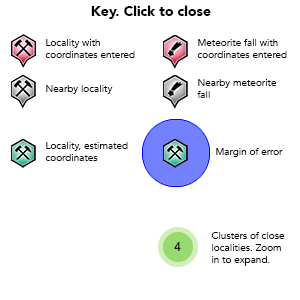 Rb–Sr isotopic data also point to a volcanic or lower crust source. 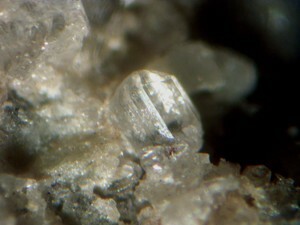 Genetic phenomena and subsequent hydrothermal alterations, which resulted in crystallization and recrystallization, gave rise to a formation of exceptional richness, not only in mineralogical variety but also in the form developed by the crystals, which adds the valuable jewellery quality of some species. 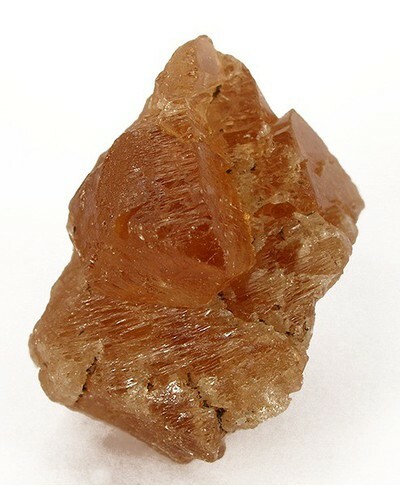 The topaz of this region offers a degree of transparency and purity, that coupled with the variety of colors (yellow, orange, brown, blue, colorless) make possible the carved stones of great value. 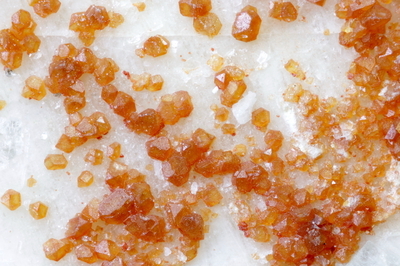 The same is true for the varieties of quartz (smoky, citrine, and amethyst, in decreasing order of importance). 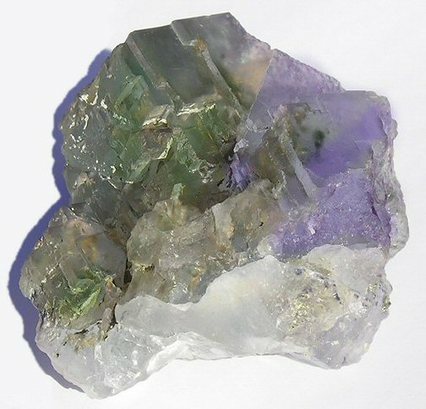 Fluorite, another species of gemological interest, comes in purple, green and pink colors with full transparency. 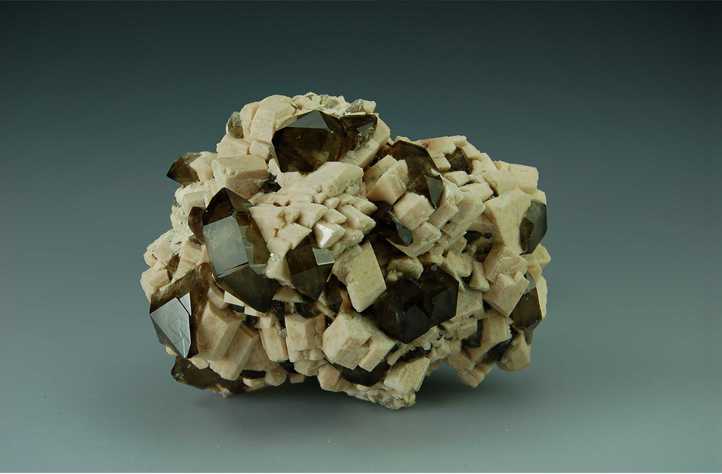 The rest of the minerals, which are not of gemological interest, present perfect crystalline forms and exceptional sizes, to which are added combining them in one piece, which gives you an invaluable for collections and museums, as well as ornamental. 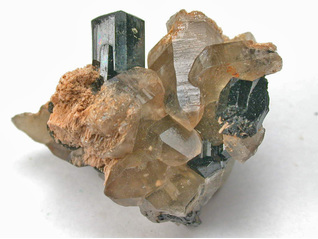 The most common smoky quartz associate is idiomorphic crystals of clear microcline in shades of pink to brown, Albite (var. 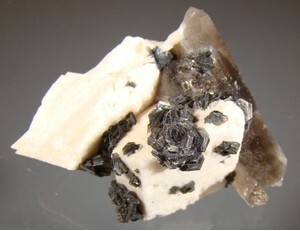 Cleavelandite), muscovite, black tourmaline (var. 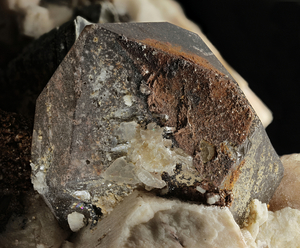 Schorl), and hyaline Quartz. 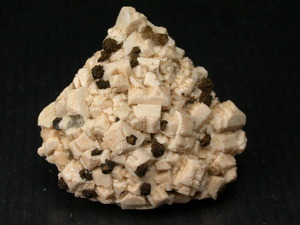 In the granite of Papachacra, this association amounts to rare and less abundant minerals making for interesting crystalline aggregates for museums and collections. 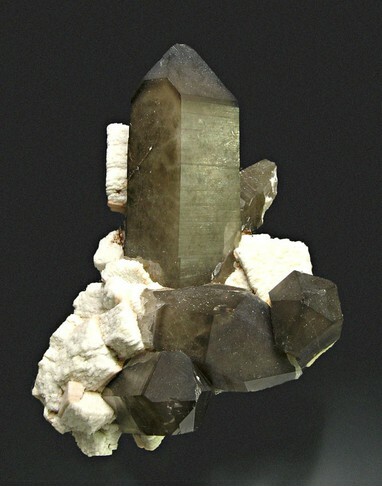 Smoky quartz and hyaline quartz or rock crystal associated with feldspar (often albite and idiomorphic microcline) often occurs in pegmatites of the Papachacra granite in the locations described for topaz. 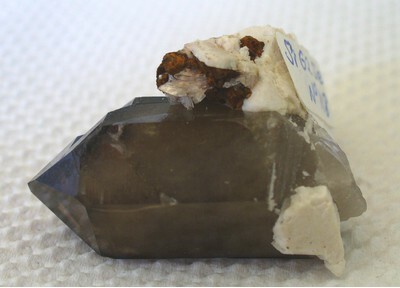 Smoky quartz color varies from brownish to golden brown, idiomorphic crystals of good quality are frequent. 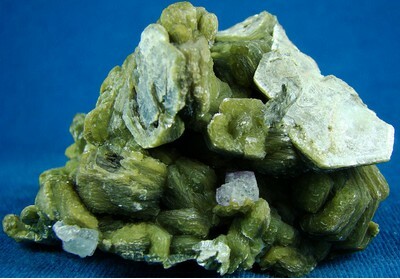 Reference: Fernando Colombo, Raúl Lirai,María Sol O´Leary y Colombo C. G. Tassinari (2010): Los diques comendíticos de Papachacra (Catamarca): magmatismo peralcalino en sierras Pampeanas orientales. Rev. Asoc. Geol. Argent. 66 (1-2). Buenos Aires ene./mar. 2010. Reference: Padrón de Minas de la Provincia de Catamarca. Reference: Saadi, J. 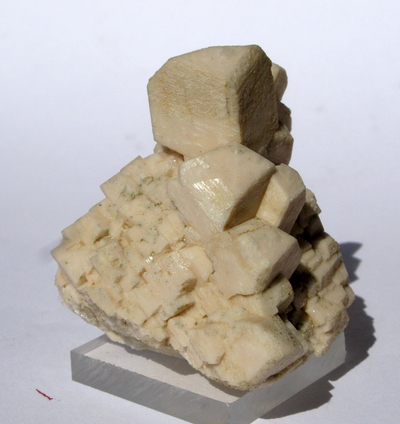 (1998): Les minéraux des pegmatites de la région de Papachacra - province de Catamarca (Argentine). Le Règne Minéral. 22, 5-13. Reference: Edwardo Jawerbaum, prominant Argentinian collector. Padrón de Minas de la Provincia de Catamarca (1999). Sola, Yamil. Berilos y Topacios. General Paz 154, Belén, Catamarca, Argentina. Phone: +54 03835-461819/462082. Juárez, Fabián A. Topacios, Cuarzo, Feldespato. Juan S. Bach s/n La Quebrada, Río Ceballos, provincia de Córdoba, Argentina. Phone: +54 03525-156 41514; y Avenida Madrid 2170, Córdoba Capital, Phone: +54 0351 4576589. Girgenti, Carlos. Topacios, Cuarzo y Feldespato. La Granja, Provinicia de Córdoba, Argentina. Kuck, A. and Saadi, J. (1992) La Mina Rumi-Tucu, Catamarca. Asociación de Geología, Mineralogía y Paleontología, Buenos Aires, 68-70. Colombo, Fernando, Lirai, Raúl, O'Leary, María Sol, and Tassinari, Colombo C.G. (2010) Los diques comendíticos de Papachacra (Catamarca): magmatismo peralcalino en sierras Pampeanas orientales. Rev. Asoc. Geol. Argent. 66 (1-2). Buenos Aires ene./mar. 2010. Lazarte, J.E. 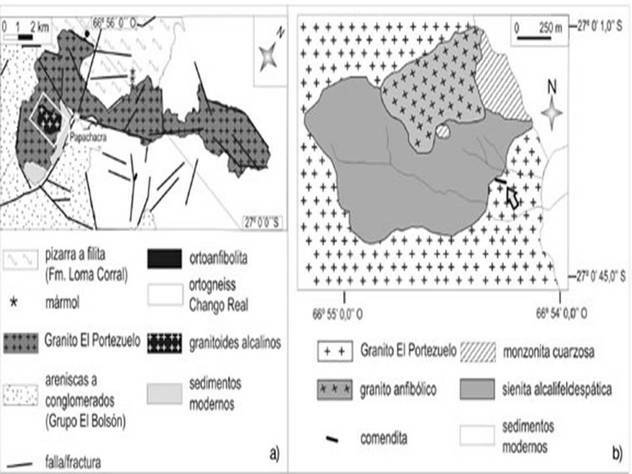 (1994) Geología y geoquímica del Granito Papachacra (¿Carbonífero? 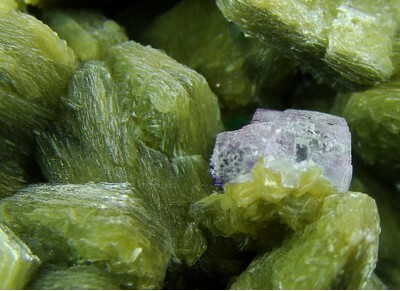 ), Sierras Pampeanas, Catamarca. Revista de la Asociación Geológica Argentina, 49(3-4), 337-352.